I look out into a sea of blue stretching out into eternity- a melody of shades carrying on endlessly. The sky and sea exist as one. The infinite aura surrounds me. In places, it ripples and its colour darkens. In others, people are placed within it- their tireless breaststrokes and shifting movements dot the pallet with flecks of pink and gold. Others are spots of brown, bobbing within the infinite. At its borders, a creamy strip of velvet froth oozes into the silky sand. In the corners left of the view, before the stretch of gradient teal, people exist in daily life. They run. They walk. They meet to eat. They feed the birds. The day goes on. The canvas, ever-changing and often unperceived, carries on. The smell of lemon - the sweet kind that fills rich custard- lingers in the air with delicate freshness. Mixed with the smell of saturated coffee ground spilled into the cup - the scent is as bold as flavour to the palet. Appetite awakens. The flakes of a lemon curd pastry and espresso emerge as a vivid dream. The pong of paddle ball becomes as rhythmic and routine as the swell of waves meeting the shore. The sound belongs to this place. As do the men who emerge to foster it. Their round figured and red shorts seem as natural as the gulls wadding in the sandy shole. So natural they take no notice from onlooker until the ball falls out of play, disrupting a certainty- that the ball will leave and again return, too and fro, like the night that follows the sun soaked day. The sound of passing cars emerges from the chorus only as the melody is interrupted. It finds its way to weave itself thus through. It is pushed away, again absorbed, and then unnoticeable. The lull of crashing waves, though the most distant, becomes the lead. 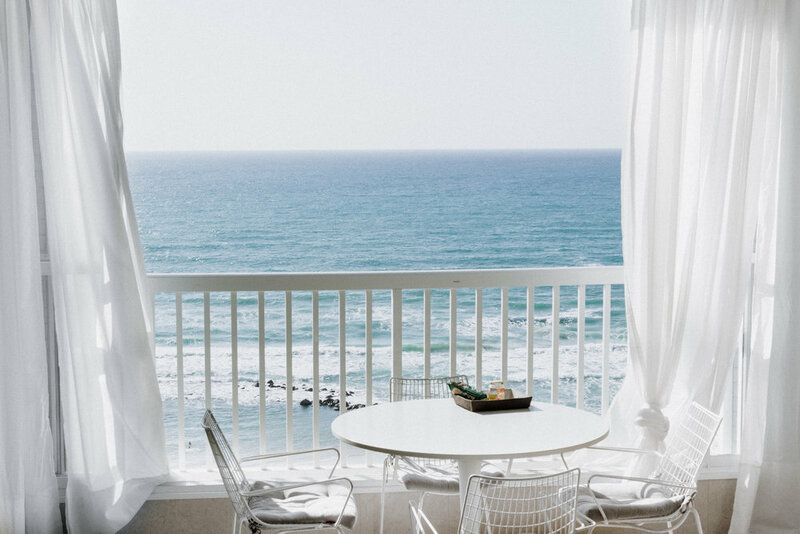 Even the faintest ripple takes a note, southing the ear even from where I sit - my balcony seat to the morning orchestra- six floors up in the apartment across the path from the shore. A soft hum fills the lyrical rhythm as a fishing boat passes through centre stage. The sound, though of the boat, pictured as the voice of a tenor- a yellow-shirted man, lit by the morning sun who is keeping watch at the bow. The guardian of the horizon. The chorus is composed on the telephone wires below. Their wings quick like rapidly repeated snaps of a shutter- the small chirps cutting through the melody of all other sounds. Shifting their sound not with pitch but with motion - they move to grassy patches beneath where seed has been left by the others listening front row. From here I write the notes. I mark each crescendo and half rest, to remember this song again. The sour scent of braised lamb melds with a dusty heat in the smooth worn allies of the shook. Each stall is its own window into a sultry den of stories. A home of silver trinkets is organized in such large heaps one believes he is digs for treasure, stumbling upon his own cherished lamp holding new fortune. The sun sulks over the pathways until it peers in over the metal sheets shielding its view. Where it emerges, it shines with brilliance - casting dubious rays on the dust polluted air. It draws the eye, up. Beyond the streets busy with patrons selecting new earthenware; Above the vibrant textiles that float in a soft breeze; Through the dull glimmer of Turkish lamps lit throughout the stalls, and into the warmth of an April desert sun. Voices measure distance. A man's deep heartened laughter marks the turn in the path. 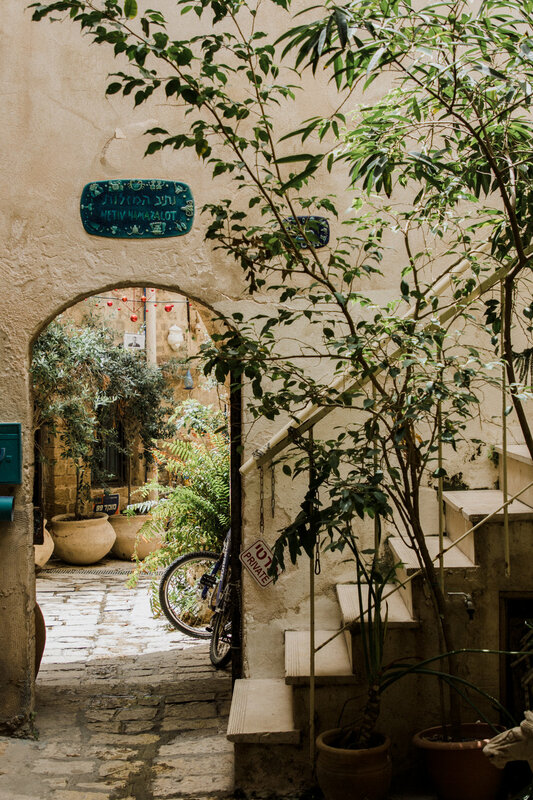 Beyond him, a vendor sings a Hebrew melody, each throaty syllable carried across the stone walls, vibrating through the corrugated roof and deep into the shooks maze of walls. A nearer voice calls faintly with invitation, pulled in the moment eyes linger. A ragged silk cloth is pulled close, wiping the brow of the vendor behind a heap of yellowed egg break. His eyes follow the gaze of passersby. Even as the sea thickens his gaze never breaks, endlessly watching. A visual pendulum amongst the flow of the shook. Days. Months. Centuries. The rhythm remains. Cait and I found ourselves in Tokyo last week during one of seven week-long sumo tournaments in Japan every year. It was an awesome cultural experience to be part of and thoroughly entertaining. It was easy, sitting in the massive Ryogoku Sumo Wrestling Arena, to become engrossed in the local sport. It's a fascinating art laden with tradition. Each move prior to the fight is ceremonial, each in its own beautiful way. I shot and edited a short film to bring you there with us on this awesome experience. Gazing down the strip of neon lights in Harajuku's main shopping street at dusk. It’s hard, in the thick of it, to give you an honest impression of Tokyo. It’s not an easy city to describe. Perhaps because it is in no simple way a singular thing. It is and yet it isn’t, in every way. Tokyo, a city simultaneously contradicting itself. Yea, I like the way that sounds. Being the largest metropolis in the world with a population nearing 38 million, I expected Tokyo to be loud in every way, obviously, but our first impression was incidentally obverse. On our first trip on the Tokyo Subway line was spent in silence. The train was full. Every seat was taken, every person awake, only speechless, mute, taciturn. Even a gentle whisper between Cait and could have been heard by all. The only sound surrounding us was the mechanical rumbling of the train gliding along the metal tracks. Emerging into the station, we were greeted by the sound of shuffling feet, moving so swiftly they collectively created a peaceful rhythm throughout the station. Like a silent film soundtracked by the menial parts of life, the opening of doors, the swiping of subway cards, the stomping of feet. Smoke rising over crowd at Senso-Ji. Two monks await a private ceremony at Meiji-Jingu. A large corporate group of Japanese men visit Meiji-Jingu shrine. Everything feels so reserved, so proper. Everyone bows for everything - a casual thank you, a hello among friends, an acknowledgment of an exchange. The city is spotless though there is never a garbage can in sight. The public washrooms all have automated toilet seats that play a variety of noises to cover over the sound of any unmentionables, birds chirping, a flushing toilet and sometimes classical music. It’s a funny clash in Japanese culture. Obsessed with sumo and sake but also Sega and Anime. Reserved and yet flamboyant. The outward adult meets the child within as men in suits stop at multi-level video arcades and read Manga on the train ride home. There are certainly two sides to everything here in Tokyo. Modernity of Monks, photographing snapshots on an iPad at Sensō-Ji Shrine. A young couple in traditional Japanese Kimonos walk through Senso-Ji. It wasn't until our Saturday night that we found a place in Tokyo were everyone seemed to confidently let loose. We finally made our way up to Shinjuku’s entertainment district. It was complete chaos. The lights were bright. The streets full. The volume finally full blast. We had tickets to see a show at Robot Restaurant, the most satisfying cheesy tourist activity I’ve indulged in in years. All the reviews said it was a corny play on the light and bright side of Japanese culture but still an absolute must see. We loved it. Divided into multiple acts, the show consisted of numerous plot lines from forest creatures wrestling robot invaders, ninja warriors at battle and a variety of random dances that, though plotless, left us thoroughly entertained. Dancer at Robot Restaurant interacting with the audience to build anticipation for the shows main act. Dancers emerge from neon smoke to start the show at Robot Restaurant in Shinjuku. Neon robot preforms disco dance as part of entertainment at Robot Restaurant in Shinjuku's entertainment district. The building itself was a chaotic mashup of kaleidoscopic mirrors, neon patterns and shiny metals. Like the inside of those treasure chests filled with kids prizes at family restaurants. Seashells, robots, rubber toy lizards and masks. It is weird. In every way. But left us laughing and amused. The city had let loose, or at least this neighbourhood had. Maybe it was just what we saw, our tiny glimpse of Tokyo, but we’ve loved it. Every quiet, chaotic minute simultaneously contradicting itself. My bedroom door rested slightly ajar, pulled open by the breeze coming through the open window. From the other side I heard rumblings of life in the kitchen. I rose out of bed and placed my cool feet on the rustic wood floor dragging them slowly across till I reached the window sill. I stretched open the shutters and climbed up onto the cement ledge, reaching for the sweater I’d left draped over the door of my armoire. Outside the window the hillside was awakening. The sun drenched the vineyard below the stone deck. The pool remained shaded by the house. The water laid silently still for all but the gnats that skimmed the surface leaving small lines across the marbled teal surface. The sound of cicadas buzzed through the vineyards as the cool morning began to drop off but it’s dampness still soaked into the dewy moss oozing from the clay layers of the terracotta roof outside the window ledge. Nicolo, the owner of the property, was tinkering with tools and old jars of nails in the garage beneath my room. From time to time I could see his white bandana and scruffy shirt through the leaves of the apricot trees as he emerge on the path to the main house. I remember smelling the apricots from where I sat, the ripest of them, lying fruitlessly on the gravel below waiting to be collected and made into a sweet spread. The smell was carried through the damp morning air so delicately you could taste them. I could still smell the rosewater soap on my hands, taste the grittiness of the wine we’d sipped the night before and feel the soot on my skin from the dusty terroir. The details all seemed vaguely familiar, like an old story I had once been told. One that I was now living. I remember taking a long look out at the vineyard and contemplating the enchanting view from the farmhouse. I thought about how we’d found this place, gotten lost and stumbled upon it. We had planned to meet Flora, the owner, in town one afternoon. Having arrived early we walked through the village, stopping for stamps at the ufficio postale and for snacks at the general store. Visitors were abstract here. We were watched by the locals as we strolled down old streets. My father showed me homes that reminded him of the one where he’d grown up, in a town just a few 100 kilometers away near Agnone. Once we’d explored everything there was to explore, we left town ready to find Flora’s farmhouse on our own. A few u-turns and dusty back roads and we’d created memories we wanted to forget. After an hour spent arguing over directions, we were defeatedly and hopelessly lost. We pulled into a local residence to ask for directions, a beautiful stone farmhouse set back off a vineyard down a long dusty gravel road. It all seemed vaguely familiar. We were greeted by a tall curly haired Italian woman named Flora. “You’re here”, she told us, “You found us!” We become the punch line in some sort of classic Italian joke, stumbling upon the exact country home we were looking for. Flora welcomed us and graciously apologized for the trouble we’d had in finding her home while she showed us around the property. It was separated in three parts, the main living quarters that Flora and her husband Nicolo lived in and two private apartments with their own stone decks - ours situated in a small nook off to the side of the property set in amongst the vines. It was there that I woke up to the enchanting tuscan scene in the morning described above. Mornings on that trip had been the most charmed of all. I think back to the homes on the hillside on the Amalfi Coast near Praiano, watching people appearing at open doors, shaking out mats on the balcony, turning corners down small streets. I imaged how the light and fresh air must feel in their homes, as I sat on our sun drenched hotel balcony. I pictured their kitchen tables and the spreads that covered them. I thought of the kids waking up for school, kicking around the soccer ball, celebrating the big win from the football match the night before. I reflect too on the nights we had at that farmhouse, ordering pizza from the local restaurant in Vagliagli. Thin crust margarita. We sat in those wrought iron chairs in the vineyard for hours, contemplating the beautiful serendipity of this trip. A few days earlier we had just happened to stumble into Siena on the eve of the Palio and watched the entire town emerge from their districts, divided by the colours of their jerseys, to watch the practice run in the main campo. Thousands of people filled the square and crowded the balconies above, as their horses too arrived in costume. School children sat cousin to cousin pridefully cheering for their districts. Family friends cheered across the square, sparring with each other through song. In front of me, one woman wore a blue and yellow scarf. Her district's colours. It was folded in half and tied loosely around her shoulders, hanging slightly to one side. On the bottom folded corner, a note. Tre Luglio, Mille-Nova-Trente-Novanta-Tre. The 3rd of July, 1993. I don’t know what the date meant, perhaps it was the year their horse won, but the traditional of it all was unmistakable. Generation after generation attended the event. Every age, every year. They’d sing the same songs, argue the same disputes and celebrate the victories. The rehearsal ended in a dead heat, a draw. The horses had false started too many times to get a clear sense of who would win tomorrow's yearly race. As the crowds dispersed and we followed Siena’s winding streets to the city walls, we watch families returning to the district neighbourhoods that have divided the city for centuries. Another day we’d spent in Florence. We met a local guide, a friend of a friend, actually recommended by the most amazing teacher who’d taught me about the history and reverence of Florentine art. Bernardo was a close friend of Madame G.’s when she’d lived here the year before, working for Gucci teaching Italian employees to speak French. We met Bernardo in the main square next to the replica of The David. He was a small older man with hair trimmed short, wearing a structured green shirt with big square pockets on each side. He felt familiar like my own Zio Igino, soft and sweet. In one hand he carried a red and white grocery bag, his lunch, filled with a few small tupperware. His brown velcro sandals were ready to lead us through the history of the public art. He didn’t look like an artist, but the way he spoke about each sculpture, describing the stories they depicted, the details of each slab of marble and how they had been so thoughtfully carved by these great artist, proved unmistakably his love of art. How can you be from Florence after all and not have an innate appreciation for the sculptures, paintings and architecture that surrounds you? He told us stories of the Medici family, how they commissioned so many of these works and why being so, many of the sculptures mimicked their facial features. He pointed out small details carved in the backs of heads made to resemble the face of the artist who sculpted them. He showed us his own favourite drinking fountain, one you’d only ever find in Florence, spouting crisp cool sparkling water. SPARK-quel-ing, he said as he tilted forward to take a sip from the spout. 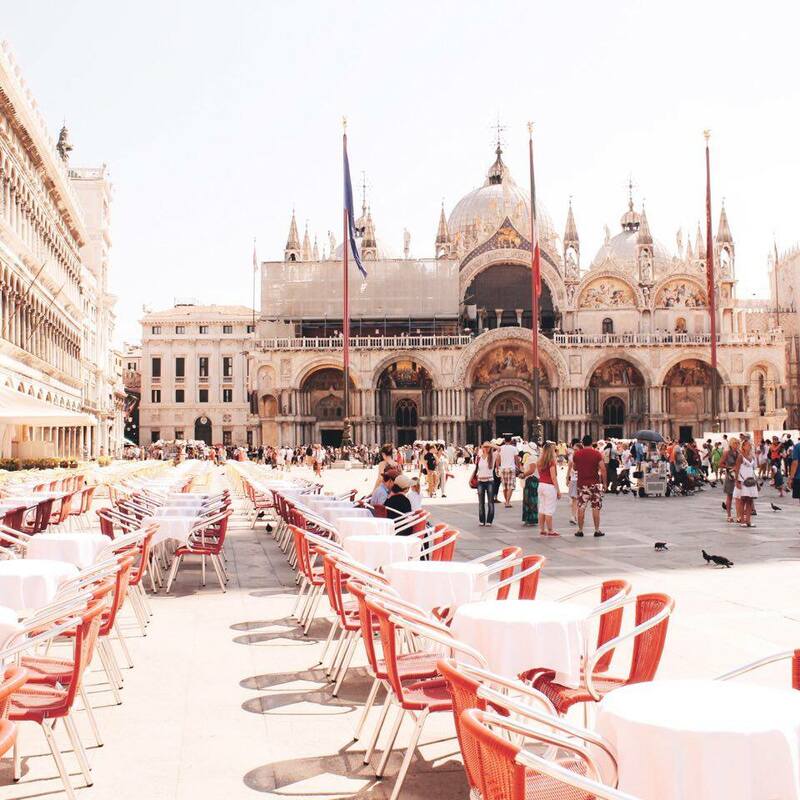 We ended that afternoon eating cotoletta di vitello e patate and risotto con asparagi at a grouping of small tables across from the entrance of the Academia, inspired by all that we had seen. I had always wanted to be there, at that table in the piazza, on that windowsill of the farmhouse, walking amongst those sculpture, listening the the vespas and the coastal spray, eating fresh apricots and sipping Chianti among the vines. And there I was, marvelling at it all. My grandparents are Italian, my father in fact was born there. They moved to Canada when he was four years old. They had a simple life in Italy in a village called La Cuppella, an Italian slang for a top a little hill. They lived in a small stone house with a wood fireplace to warm them on cold nights. My father and his siblings slept across the street in the loft of the barn. A far cry from where I was, sitting peacefully on my windowsill. After the war, my grandfather started saving money for a ticket to cross the seas, leaving Italy when my Dad just only 6 months old. He later saved money so his family to join him. When my grandmother Carmina and her four sons left Italy, they packed up all they had into a large black metal chest and headed to Naples to embark on their voyage across the sea. My father (left) and his family in the dinning room during the crossing from Naples to Halifax. 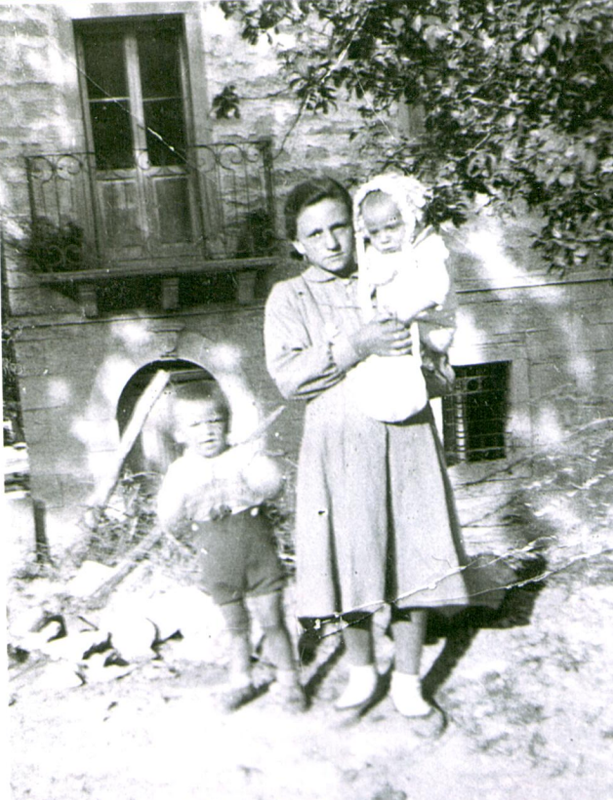 My father as a baby with his older sister and brother. My grandmother returning to visit the village where they lived. My father remembers none of this of course, being such a young age at the time, but I often reflect on how daunting it must have felt. My father hadn’t ever even seen a boat before they embarked on that long trip at sea. Only two generations removed, my life had been so different from my grandparents. The same views that to them were boundaries and limitations, were to me, endless landscapes I could freely explore. It think that’s what captivates us all in Italy. It is the history of the place. To wander down a small path, sleep in a home or eat in a piazza where you know generations before have done exactly the same. That history is so beautifully preserved. Whether it’s in the tradition of community life on the coastal hillsides, in the regions whose soil have produced endless barrels of wine, in the main squares that continue be the meeting place for life and laughter and competition, or in the works of art that were once touched by the hands of inspired artists. Everything old is new again only seen with fresher eyes and we are able experience history, not in dimly lit exhibits of a museum, but in the most serene moments, looking through the open shutters of a window peering down into the valleys and vineyards below. I am excited to share a new local project with everyone. Check out This Old City, the new podcast part of theroadsitravelled.com. Join us as we explore urban landscapes week by week and find out why locals love their city. You can listen to the podcast through the PODCAST tab on our menu or by searching This Old City on iTunes. Our first two episodes explore locals favourites in Canada's capital city, Ottawa, Ontario, including the graffiti wall under the Bronson Ave. and Riverside Dr. bridge and Bank Street's new coffee house, Arlington Five. It's been over a month now since we've completed our more than 5000 mile tour across the Western United States and I still feel my energy levels are recovering. We saw seven states, six national parks and three national forests in under two weeks. It was exhausting, exciting and incredibly epic. There were many cold nights, numerous make shift dinners, heaps of sand and dirt stuck in our shoes and multiple bug bites but we've made it home unscathed. Luckily, with awesome Marley Coffee beans to fuel our morning spirits we were set. We both hate mornings but we were up before the sun almost every day. We didn't let exhaustion damper our morning mojo. I believe it's because Ellie and I agreed that the first thing to be done in the morning was make coffee. We'd set up our rickety camp stove and set our water to boil. Waited. Waited. Then finally when the water boiled we mix it in to our little french press and again we waited and waited. And Voilà. Finally, the most beautiful cups of morning coffee. (Making coffee on the road certainly helps you appreciate coffee makers and Keurig's.) For anyone whose every used a french press you'll know how much more difficult it is to get the perfectly tasting cup but with the right richly flavoured beans even us two novice girls, with morning grogginess against us, managed to brew a perfect cup. Marley Coffee was one of the top three most valuable things we brought with us, along with our trusty GPS and those precious wet naps that helped us clean up our messy car snacks. We would have been a hot mess without them all. I promise this is the only legal stimulant we brought with us from Colorado, but big thanks to Marley Coffee for providing us with it. Our coffee mugs were always with us, keeping our stamina high day after day. Looking back over the photos we took along the way, our Marley mugs were always in hand. Off in the corner of a picture of me yawning before we started a morning hike through Zion National Park, of Ellie stretching out after the long drive up to Sequoia National Forest and in so many of our morning route mapping meetings by the campsite. It's been another crazy adventure we've now got under our belt, leaving us with a sweet taste in our mouth of the next adventures to come. To see more of our wicked adventure and tag along on some of the epic 5000 miles we covered, click to watch the video below and share it with those you'd like to take this journey with. It was a long day's drive from Crescent City, California all the way up the coast to Cannon Beach in Northern Oregon. We had crossed most of the length of Oregon State within the morning and were feeling the effects of the miles we'd been covering. Luckily, Oregon offered us a taste of refreshment and relaxation. We had two days planned at a campsite near the beach. arriving early afternoon the first day. Quickly we went through our routines of setting up camp and headed down to the beach in dazed exhaustion. The sand was soft. The air, cool. The breeze, salty. But most distinctly, I remember it all being still. Everyone on the beach walked slowly. Voices were muffled by the wind and the waves rolled in softly. The tide was going out as the sun was setting, creating an enticing effect on the shoreline that lured us closer to the water. The tide had receded almost a few hundred yards but had left a small cover of water over the sand it had once covered. It appeared as though a layer of glass had formed on the shoreline, one that was now perfectly reflecting the sky above. Those that walked near the waves seemed as though they were were floating in the sky. I'm so glad that my camera could capture it (see picture above) because it is view I never want to forget. We sat there for a while, snacking on the most delicious lemon meringue ice cream i've ever had, taking in the surroundings. I have always, quite faithfully, been a fan of mint chip but after this one ice cream cone, lemon meringue has forever become my new favourite flavour. Feeling refreshed we decided to do something that I believe will forever have me perplexed. We decided to go for a drive. We had already covered more than 3000 miles sitting in the car listening to the same playlists on repeat. Some how though, the thought of getting back in the car for a leisure drive down the coast was still alluring. We spent an hour driving the coastal road with the windows down. I felt I was in a haze. Dirty, tired, crusty, and yet blissfully happy to have the the wind on our faces as we drove. Oregon gave us the break we needed. It made us love the road again. Needless to say, our morning of rest that followed, without anywhere to be or any need to pack up was the most rejuvenating of all. We got an extra 5 hours of sleep that morning and boy was that a beautiful thing. We even got a chance to finally make our own coffee (generously supplied by our friends at Marley Coffee, more to come about that amazing company in an upcoming post). Rejuvenated and excited, we'd head North to our last two spots before our treacherous 1500 mile, 20 hour trek back to Colorado. Stay tuned for more about the beautiful coastal cities of San Francisco, Portland and Seattle and a first hand look at video footage we captured along the amazing roads we travelled, coming soon on the blog! It was early afternoon when we arrived in Sequoia National Park. I was excited. I was about to cross something big off my bucket list, hug a giant tree. The thought of it was occupying my mind and any other questions of time or food or direction were put in second place. I had one goal for the day. Hug that tree! So when Ellie and I pulled up to the park entrance, we quickly grabbed a map from the park ranger, asked her to mark all the best spots and inquired if she had heard of our campsite in Eshom Creek ( which she had not) and were ready to head on our way. First mistake, never enter a national park when relying on cell service for directions, especially when the park ranger (an expert on the area) hasn't heard of your campsite. Nonetheless, we continued on. Obliviously. We spent the better part of our afternoon frolicking through the forest trails, taking pictures, crooking our necks upwards to stare at the towering trees. And finally, the grand hurrah! I got to hug a giant tree. Redwoods sort of feel furry so it felt kinda like hugging a giant, very hard bear. It was great and I felt tiny (even more than normal). Unfortunately the excitement was short lived. We realized that we had no idea where our campsite was. We couldn't find it on a map, we had no cell service, and it was close to dusk. We were in a jam. Finally, as we hit the western outskirts of the park we got enough cell service to find directions to our mysterious campsite in the woods. All was solved. That is until we saw the road Siri was telling us to take, the only road in a 25 mile circumference that could lead us to where we needed to be. Now i've travelled down some rough dirt roads in my experiences abroad (see posts about getting lost in Corsica's GR20 trails), but this experience was next level terrifying. We had a quarter tank of gas, no address or printed map, had now lost cell service and were set down an unpaved primitive road in the wildness of the Sequoia National Forest, at dusk. The built in GPS in our truck said we weren't even on a road, and we agreed. The road was wide and even when we started down it but had somewhere along the way, all of a sudden, narrowed into a steep, treacherous, cattle trail that lined a sudden dropping cliff. Siri had led us astray. There was no room to turn around anymore, so we kept driving onward sure that at some point we would reach a main road and thankful that we were driving a 4x4. I remember thinking, 'Worst case we sleep in the car'. Then I looked out the window and saw the size of the bear droppings all over the road and decided that may not be the worst case, that in fact there could be a much worse situation that could play out. Soon after, Ellie pointed out a large animal skull in the middle of the road. It was clear that no one had driven down this road in a long time. I'd like to think I am an outdoors wilderness survivor, the kind of person who could go into the woods and live, alone, for months. I think, in the midst of a mild panic of determining where we were and what to do, I discovered that I'm not. I'd love to say the idea of setting up camp in wild bear country was enticing to me but it wasn't. I was scared. Truly, honest to goodness, scared. To put my readers at ease, we did eventually find our campsite. It was at a beautiful spot secluded in the woods. And no, we didn't come the right way. There was a roughly paved road leading straight from park entrance. The campsite host greeted us when we arrived and informed us that yes there were bears in the area, as well as a Mountain Lion he liked to call Kitty. I was less scared but still enough on edge I need a sleeping pill to knock me to sleep that night. We learned our lesson the hard way, the lesson being this; sometimes in life, the road less travelled should be left that way. It was early, before the crowds had emerged and the coastal shoreline was still quiet. We had already packed up camp to head back out on the road, a task we were getting impressively efficient at accomplishing. We’ve been camping most of our way across the West and with that we’ve grown use to living like vagabonds. Our morning in Big Sur, however, offered the perfect dose of serenity for our chaotic life on the road. Most mornings on our trip have been stunning but Big Sur was especially spectacular. I’d like to think the coast was waiting for us that morning. We found a quiet ledge to lay down our cozy camp blanket and sipped on coffee while we stared at the coastline. Big Sur lives up to the hype. It really is as scenic as people describe. If you’ve been, I know you’ll agree. If you haven’t, you’ll have to believe me. It is California’s diamond in the rough, jagged and raw but in its own way pristine. The water is a rich azure until it hits the toothy rocks on the shore and creates a foamy froth, offering a rich white contrast to the coastline. We sat there, probably a little to close to the edge, soaking in the surroundings and cooling off in the strong ocean breeze until it was time to head back out on the road. It’s hard tasting something so unique and having to leave it so soon, but the excitement of seeing what’s beyond the next left turn or highway exit keeps us moving. We like to think we are bringing a bit of each place with us as we move along, though realistically the parts we are carrying with us are through the dirt on our bodies and the stains on our clothes. My jeans are currently 6 inches deep in salt stains from walking the coastal shores. No exaggerations. All in all, the vagabond life has treated us well and so we are back on the road and headed north, off to find a Laundromat in San Francisco. After days of surviving with damp sleeping bags and PB&J's, we've finally found the perfect taste of luxury at our little oasis in Joshua Tree. Many of you have been wondering where we've been staying from the photos of the rustic inn. I've been sharing with my Snapchat followers, so I thought I'd share more with you all. The property is stunning, and has been in the owner, Jane's, family for four generations. Her great grandfather purchased the land during the 1920's and once owned the land that the Joshua Tree Visitor Center is now situated on. He donated the property to the park in 1950. The aura here is the perfect blend of rustic and luxury, a perfect place for campers and roadtrippers like ourselves to find refuge from the desert heat. By the pool, blue pastel walls offer rich contrast to the exotic cacti. Behind it lies the Faultline Farms, the property's own organic farm, from which the restaurant draws most of its produce rich ingredients. A pond oasis and grass opening towards the back of the property, offer a relaxing space to sit and drink coffee or stretch out through morning yoga. Surrounded by large palm trees, it is the perfect place to find refuge from the scorching desert heat. The desert by night is unlike any other view. It is rugged and barren but in its own way, pure. The sky becomes an eerie blue and the sun sets a deep orange. The air cools and the chaos of the day quiets to a dull hush. Everything feels fresh. The armor needed to survive life in the harsh elements is removed and everything can once again breath. A warm breeze blows through, bringing new life to the desert floor. The prickly cacti emit smooth shadows. The sound of snakes rattling in the heat is overpowered by the gentle rhythm of cicadas. What once seemed so lifeless is suddenly alive. On the path to our room we come across an array of vintage vehicles. An old fashioned foodtruck sits abandoned in one corner, visited by those seeking a cozy reading spot. Across from it is the old pick up truck covered in straw. Around the bend, my personal favourite, the vintage Airstream camper in all its glory. The grounds are stunning and offer the perfect desert oasis we were searching. We are selfishly wishing we could stay longer. Tomorrow we are headed to Sequoia National Park, with hopes that nature will treat us as kindly as moonshine lemonades by poolside at the 29 Palms Inn. Let me start this post by telling you, that I am writing to you from the rooftop of my friends Jeep Wrangler as we watch the clearly lit stars in the Mojave desert sky. It is stunning. We are staying the next few nights at a charming oasis in Joshua Tree, a much needed treat after yesterday's strenuous adventuring through The Narrows at Zion National Park. I’m not complaining, the pain was well worth the gain. Nonetheless, my muscles are aching. The hike begins at the end of the shuttle line through the park. Intimidated by the well-experienced hikers, Ellie and I began to realize how little we knew about what we were about to literally dig our heels into. I think that was the fun of it. We had no idea what to expect, except for a few photos we’d see through Zion hashtags on Instagram. We just kept hiking through rocky pathways, trudging through waist deep water up the narrow canyon. The water is murky so the smooth rocks of varying sizes below the surface make it a challenging hike. Safe to say I almost lost a toenail a few times to a large rock hiding below the surface. Learning how to balance yourself on the rocks below without rolling your ankles takes a little practice. Eventually, though, we were soaring though the rock mazes. About five miles into the canyon, Ellie and I spotted a side canyon we had heard about from some newfound friends on the shuttle bus. Curious what was up there, we followed the second path. It was stunning, and challenging. Every few 100 feet we were challenged with a new obstacle we had to maneuver ourselves up, around or through. At points we found ourselves neck deep in water bracing ourselves to climb up slick wet boulders, almost twice the height of ourselves, to continue on to the next level of the canyon. It seemed easy in retrospect to figure out what path to take up the rocks, but when your staring at it from a distance it’s perplexing. Shout out to Zac and Sam from Alabama and Mississippi, who we used as guinea pigs for finding the best route through some of those most narrow passages. We booked it out of the park and ordered ourselves two massive hamburgers at Oscar’s Café in Springdale. Thank you to our server Shawn from Boulder, Colorado for putting a rush order in for these hungry girls. We didn’t order a torrential downpour but it came with our meals anyways. Made it out of the narrows in the nick of time. We don’t know if there were any flash-floods that afternoon but we’d like to think it was another disaster averted and one more awesome adventure under our belt.